Through the Bishop Peterson Corporation, a separate legal entity from the Council and the Knights of Columbus in general, the Hall may be rented by a Brother Knight of Council 4442 and/or Assembly 0641. The hall is not available for rental by the public. 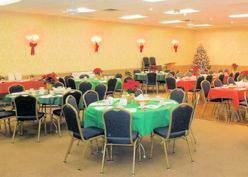 The hall may not be rented for a "for profit" function by the Brother Knight unless it is for a charity approved by the Board of Directors. You may download / view the Rental Agreement by clicking RENTAL AGREEMENT. However, do not complete the form until you confirm your requested rental date with the Rental Manger. - The renting Brother Knight is required to be at the function at all times and is responsible for clean-up. - The renting party shall be responsible for all damages and for the nominal cleaning of the areas used by clearing the tables and placing all trash in plastic bags, putting the trash in the outside shed, wiping down the kitchen (if used) and vacuuming the hall. - Hanging of objects from walls or ceilings is prohibited. - The second floor is off limits during the function. The sliding doors shall be closed by renter to restrict access to the second floor. - The facility is non-smoking and abuse could result in the loss of the retainer fee. Smoking is allowed outside of the building. - The renter is required to be familiar with the safety procedures and equipment of the hall (Fire Extinguishers, Emergency Exit locations, telephone locations, AED, First Aid kit, etc.) The AED is described on the Corporation Items page. 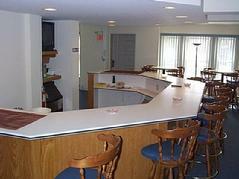 - No alcoholic beverages are to be served or sold by the renter or its hires. Alcohol is strictly on a BYOB basis. - The entrances to the building, as well as the kitchen area, are under video monitoring for general security; there are no cameras in the general hall area. Rental agreements are available by contacting the Corporation Hall George Masciarelli at 603-893-3035, or by email to Hall Rental. The basic rental fee is $200 with a retainer fee of $100 for a total of $300. Please make all checks payable to Bishop Peterson Corporation. 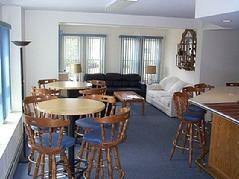 Use of stove, oven, microwave, refrigerator, steam table, ice machine, coffee makers, and bar area is allowed. An additional fee for use of kitchen utensils shall be $100 (dishes, silverware, pots, pans, etc). Use of the convection oven is not allowed under any circumstances. No third party checks are accepted. Upon final inspection after the function, if no damage has incurred, the retainer fee will be returned. If there is damage, the repairs will be deducted from the retainer with the balance, if any, returned to the renter. The renter will be responsible for washing all utensils / equipment used and cleaning the kitchen to have the deposit returned. If renter chooses, he can notify the Rental Manager to make other arrangements for kitchen cleaning - in which case the $100 fee is forfeited. For a new member to rent the hall, he must have been a member for at least four months and been involved in four or more meetings or activities. © Copyright 2013 Bishop Peterson Council 4442, 37 Main Street, Salem, NH 03079. All rights reserved.